Arun Shourie, who was part of NDA, a fellow traveler and an ideologue of BJP wrote several books, many of them against minorities and dalits in particular. One of these which was strongly protested against by large sections of people, dalits in particular, was his “Worshipping False Gods”. In this book he expressed the mind set of RSS-BJP politics towards Ambedkar. 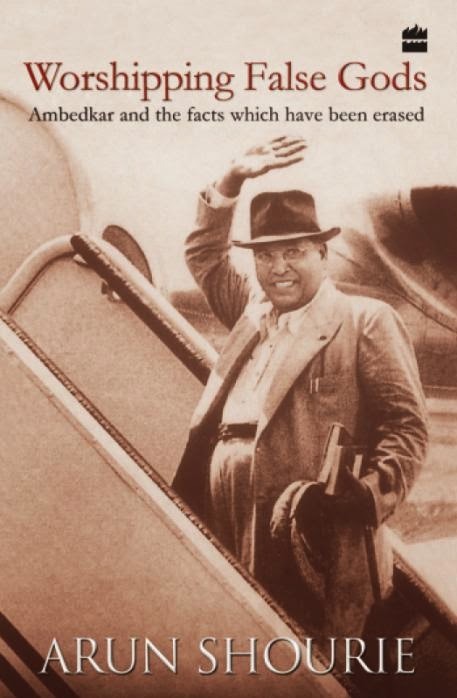 In this long bulky volume he was heavily critical of Ambedkar’s ideology, his agitations for democratic values and his struggles for social justice. Now a decade and half later on one side many a dalit leaders, Ramvilas Paswan, Udit Raj, Ramdas Athwaley are vying to sit in the lap of the politics of BJP for apparently their own personal gains on one side and on the other the BJP’s Prime Ministerial Candidate Narendra Modi is going miles to woo the sections of dalits. It is another matter that while doing this in his usual trade mark style he has no qualms about misrepresenting the events, speaking lies and putting the blame of all that has not taken place to his political adversaries. This 14th April (2014), on the occasion of Ambedkar Anniversary, one saw the Prime Ministerial aspirant wearing the blue jacket and offering flowers to the architect of India’s Constitution. He bowed in front of the portrait of Babasaheb and said that it is due to Babasaheb that people like him have come up in the society. Lets note that Modi despite belonging to RSS combine, which does not project the caste as such, is projecting his caste prominently in UP and Bihar. RSS is opposed to disturbing the prevalent status quo of caste hierarchy. Modi’s postures show the impact of caste politics and its recognition by ideologies which generally have been condemning the politics in the name of caste. They are using the same card when it has come to the present elections. One only has to say that even the person coming from the low caste dalit can adopt ideology which is against the interest of that caste. Just opposite to that even individual from upper caste can also work for the goals of annihilation of the caste and social justice. Many of the supporters of Ambedkar were from upper castes. Modi’s flaunting his caste in UP and Bihar is under the pressure of electoral compulsions, while his politics as exhibited in Gujarat and the ideology of RSS, his parent organization, has nothing whatsoever aimed at achieving social justice in any sense of the word. While he is tom toming about his caste, what has been the condition of Dalits and Adivasis in Gujarat during the last decade or so? Most of the policies implemented by him are totally committed to the interest of the Corporate. The schemes initiated by Central Government, which aim at the benefit of this section of society, have been put on the backburner in Gujarat. Modi, in violation of Planning Commission's directives, had not held a single meeting for the Sub-Plans for SCs and STs that seek proportionate spending for the welfare of the two communities. In Gujarat 27,900 posts for SC/STs were vacant and they could not be filled because of a prevalence of the reservation policy in this state according to which it is compulsory that a vacancy in a district be filled locally only. For example in the city and district of Ahmadabad, from where Narendra Modi has been elected to Assembly, as many as 3,125 SC students have not been given their SC scholarship till day. Independent surveys show that untouchability and denial of entry to dalits in temples was widespread in 1,600 villages of Gujarat. Dalits from different parts of the city came together on together on 13th April 2014 and spoke against the "much-touted development model of the Gujarat government." (http://timesofindia.indiatimes.com/home/lok-sabha-elections-2014/news/Modis-development-model-ignores-dalit-rights-Dalits/articleshow/33785414.cms) They pointed out that the Gujarat government had failed to provide a proper model for transformation of dalit lives. As per their memorandum drafted by the agitating dalits "Chief Minister Narendra Modi has been propagating a lopsided development model which largely ignores dalit rights. The government has given land to industries instead of dalits who deserve it more… we have demanded land for dalits, tribals and OBCs under the Land Sealing Act. We have also sought for an official ban on manual scavenging and an end to the policy of giving jobs on contract," It is interesting to note that Modi has been defending the manual scavenging work as a spiritual experience for the Valmikis in his book Karmayoga. This book seems to have been withdrawn after the ciriticsm was aired by many activists. One also notes that in Gujarat the conviction rate in atrocity cases is just 4%. Though there is a provision for special courts in every district, the government has not set up such courts that would help expedite disposal of the cases. Additionally in tune with his spreading of falsehoods on regular basis, Modi went on to say that Congress Government has ignored Babsaheb, and it was BJP Government which gave him Bharat Ratna. One knows the audience is not very critical in public meetings and so there is no protest when such blatant lies are dished out. This lie of his not much attracted the media attention. We know that the first BJP Government was formed in Center for 13 days in 1996. Dr. Ambedkar was conferred posthumous Bharat Ratna in 1990 by V P Singh Government. It was during V.P. Singh’s tenure that the portrait of Babasaheb was also unveiled in the Parliament. It was this Government which implemented Mandal Commission and also honored Dr. Ambedkar. As such BJP, Modi’s party has never been comfortable with the values which Ambedkar stands for. The values of Indian Constitution, Liberty, Equality, Fraternity the core values of Indian Nationalism. Modi recently said that he was born as Hindu and he is a nationalist so he stands for Hindu nationalism. Ambedkar was the staunchest critique of Hindu nationalism. Right from the beginning of its formation RSS stood for upholding Manusmriti and was opposed to even the efforts which went to bring in Indian Constitution. As per the issues related to social justice, dalits human rights the major focus of human rights activists has been critical of Gandhi and Congress, which has lots of merit. But at the same time the politics which is totally opposed to the values of Dr. Ambedkar is the politics of Hindu nationalism. This is the real opponent of social justice, and it has not much been taken up for critique by dalit activists-intellectuals. And that is the politics of Hindu nationalism, the politics of RSS to which Modi belongs. The very measures for affirmative action, the implementation of Mandal Commission and the like were opposed either directly or subtly by RSS-BJP-Modi politics. Demands of electoral politics makes strange demands, one starts making public postures and makes statements which are polar opposite to their core ideology and manifest actions. That’s ‘Ambedkar-worshipping’ Modi for you!